Bulgarian archaeologists have discovered a treasure of bronze coins during excavations in the Black Sea resort town of Sozopol. The treasure was found hidden in a small jar, and consists of 225 Ancient Greek bronze coins, explained the leader of the archaeological team, Prof. Krastina Panayotova, as cited by the Focus news agency. The coins are well-preserved, and were minted in Sozopol in the 4th century; they were found during excavations of a necropolis in the Budzhaka area close to the Black Sea town, she explained. "They were not found in a grave, they are not part of a funeral, this is a treasure, a "classical" case of buried treasure. We have never found a buried treasure before. I have been dealing with Apollonia (Sozopol's Ancient Greek name – editor's note) for 25 years, and have never seen anything like this. It is very rare to come across such a find in a necropolis," Prof. Panayotova explained. 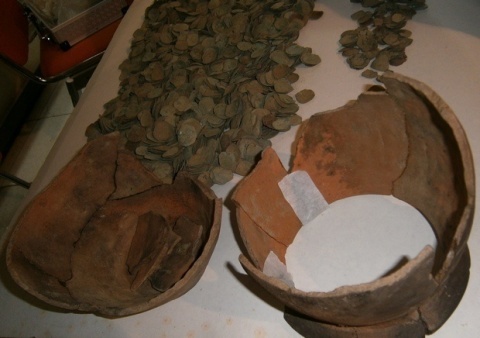 She said she knows of one more case in which a vessel with coins was found in a necropolis in Romania but the treasure found in the necropolis near Sozopol is a precedent for Bulgaria.